There are tens of thousands of Harley Davidsons pounding roads across the globe, at any given minute. 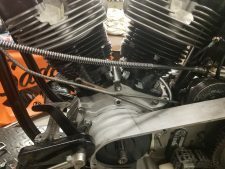 In time, it is inevitable, that many of these motorcycles will be ridden, long and far enough for a much needed motor rebuild. There are a number of different reasons a rebuild will be considered. A preventative, planned rebuild is when the decision to rebuild is based on miliage or, sometimes, age. 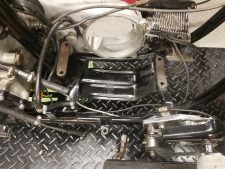 The motor may not have any noticeable issues but the owner wants to be proactive in hopes of avoiding inevitable problems or failures. Sometimes a motor will be rebuilt because of oil consumption or smoking. These conditions are usually indicative various piston ring or valve/valve seal issues. There are many catastrophic problems that can occur when a bearing fails. 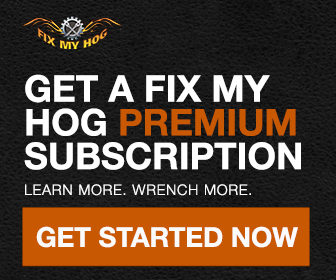 Failed/broken tappet bearing, broken cam bearing, bad connecting rod bearing, etc. You will find yourself getting into your bottom end when problems like these occur. 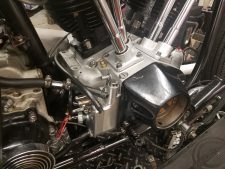 Recently, we had a Shovelhead in the shop that was having starting issues, running poorly, and a noticeable knocking/ticking audible. 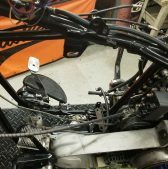 A compression test helped us to determine that the front & rear cylinders were more than ten percent (psi) away from one another, with low compression in the front cylinder. This was enough info for us to want to get into the top end for an explanation for the poor front cylinder compression. Once the heads & cylinders were removed, we discovered a deep groove in the front cylinder. A wrist pin clip had come out. The clip and wrist pin gouged the cylinder wall. Knowing that wrist pin clips don’t typically fall out on there own, we proceeded to inspect the connecting rods. We discovered that the connecting rod bearing had failed. This forced the connecting rod into an unstable path of travel and put excessive pressure on the wrist pin, forcing the clip out of its position in the piston. This motor was in need of a complete rebuild. Bottom, up. Every bearing, gasket, and seal. Not only pistons and rings, but also new cylinders, as the groove in the front cylinder was too deep to correctly machine and size. The oil tank was removed and flushed and the oil lines replaced. Here are a few photos of this job.